It’s time to scale up production a notch. When you try to scale anything up, you inevitably run into challenges. Maybe you find that the equipment isn’t up to task – maybe you find that while you had plenty of stamina to mix and package 500 servings, 5,000 was a different story. But scaling up also lets you try things you couldn’t do at first – and brings into view some neat options that are worth talking about. For starters, fatCoffee Chocolate will soon be available. I used 100% organic, raw cocoa powder for this new flavor, rich in antioxidants, magnesium, iron and fiber. There is absolutely no sugar in this, but you still get a rich, creamy, decadent flavor. I really hope you’ll try some. If you’ve tried fatCoffee (you have, haven’t you? ), maybe you’ve found it challenging to pour the contents into a thermos suitable for shaking, or whatever container you’re using. If you’ve gotten the hang of tearing off just a corner of the packet, then you’re probably fine. But why should you be leaving it to chance? Up until now, fatCoffee has been packed in stock-sized square packets. At the quantities I’ve been working with, this is the only option. But now there’s a new option coming into view… with your help. These are the first prototypes of the fatCoffee Stik Paks. They’re longer, narrower – but they hold the same amount of fatCoffee (one marvelous, fluid ounce.) And they’re still tough as nails, and won’t open until you need them to. If you look closely at the top, you’ll see that they’re sealed in a few different ways – we’re experimenting with the sealing angle so that when you tear them open, you’ll be able to squeeze the fatCoffee right into any thermos or water bottle. And because of their size and shape, there’ll be less waste as well. 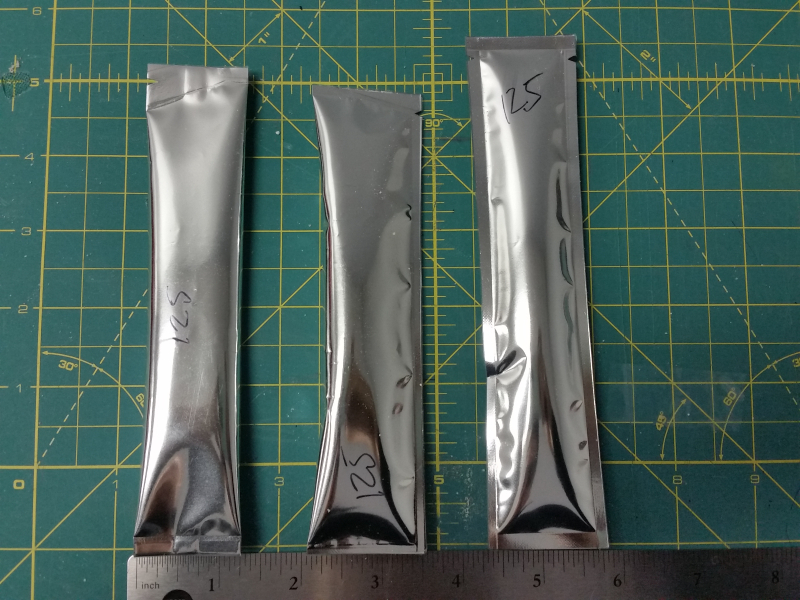 Here’s the catch: these are fully-custom, tricked-out, 3-mil, metalized foil pouches. They’re just the right size, because they’re unique to fatCoffee. And I have to order at least 50,000 of them. That’s a big commitment. But I’m ready to make it – with a little help from you. If I can get 50 more people to subscribe to fatCoffee, I’ll be able to place an order for the first production run of these new packs, and we’ll be on our way! If you’ve tried fatCoffee and enjoyed it, a Premium Subscription is the best way to make sure you get to enjoy fatCoffee every day. You get up to an extra 10% off, plus some free goodies in each shipment. And you’ll be helping to make the next Release of fatCoffee our best, evah!